The Red Bulls announced on Tuesday morning that they have signed Jamaican international Kemar Lawrence to a new MLS contract. Lawrence, who has amassed 117 appearances across all competitions for the club, signs a multi-year deal to remain with the Red Bulls. "Kemar has continued to grow as both a player and person here, and has earned this new contract," said Red Bulls Sporting Director Denis Hamlett. "He is one of the best outside backs in our league, and his strengths make him a perfect fit for our team and our style of play. Kemar has played a key role in our success over the last few seasons and we're pleased to have him continue to be part of our club." Lawrence has been a reliable defender for the Red Bulls, appearing in 93 of the possible 138 league matches, only missing time to represent Jamaica. In MLS, the Kingston native has tallied four goals and 10 assists, including two game-winning goals and seven game-winning assists. Outside of league play, Lawrence has started 21 of the 24 matches he has competed in with two assists. 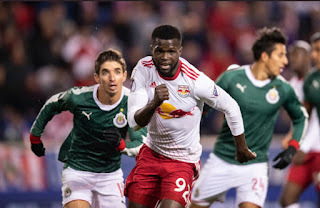 "Kemar has worked hard to establish himself as one of the best left backs in the league," Red Bulls Head Coach Chris Armas said. "He takes pride in his one-on-one defending, he plays for the team, and continues to improve. Kemar is also fearless and we love the personality he adds to our team. This new contract is well deserved." Lawrence has also cemented himself as a Jamaican National team starter. The Reggae Boyz left back has accrued 47 appearances, including 45 starts, since his national team debut during 2013 Concacaf World Cup qualification. He has recorded three goals and five assists, appearing in both the Copa America and Gold Cup, where the Reggae Boyz reached the final in 2015 and 2017. Lawrence and the Red Bulls are home on Sunday, September 30 to host Atlanta United FC in a battle of MLS' top two teams. Kickoff at Red Bull Arena is set for 1 p.m.